In 2012 miniature products of Terracotta made by Om Prakash Galav on potter’s wheel which need magnifying glass to be seen. These miniature items including matka, tea-set, lantern, chain, bowl, kalash, hookah, stands, bell etc. Besides this he also recreated the extinct art of Alwar “Kagzi-pottery” and have tried to revive it. 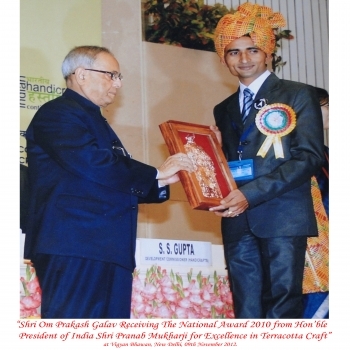 He was thus selected for the “National Award 2010” by the Office of the Development Commissioner of handicrafts, Ministry of Textile, Govt. of India for His Excellency in Terracotta Crafts.